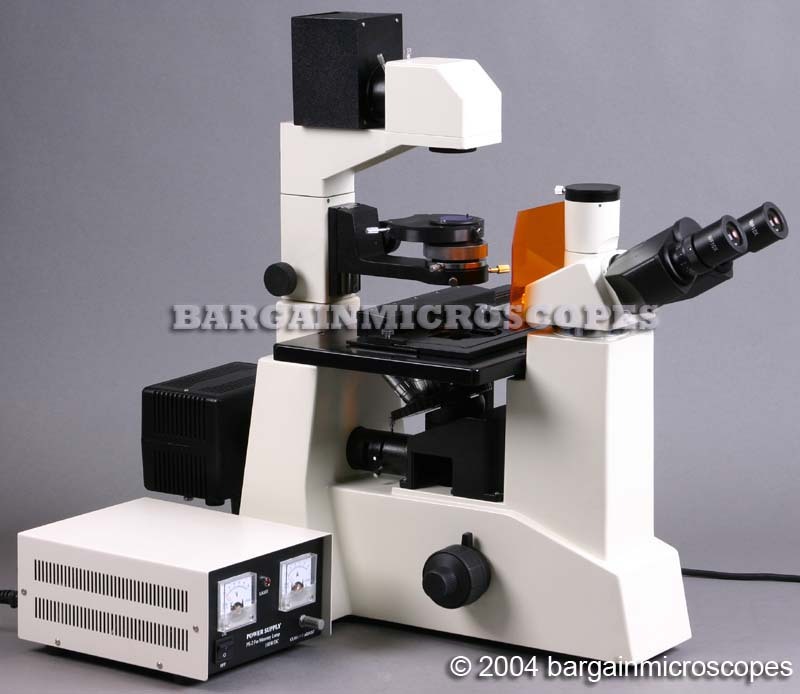 Typically Costing $6K+, Our Line of Fluorescence Microscopes provide Nice Quality at Unbelievable Prices! 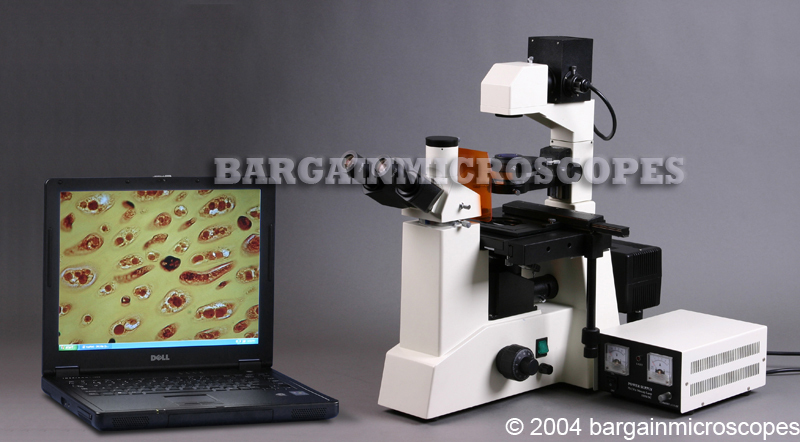 Professional Inverted Epi-Fluorescence Trinocular Tissue Culture Microscope! Three – In – One Instrument: Capable of Three Major Areas of Microscopy: Fluorescence (via Incident Light Excitation), Phase Contrast, Brightfield (via Transmitted Light). 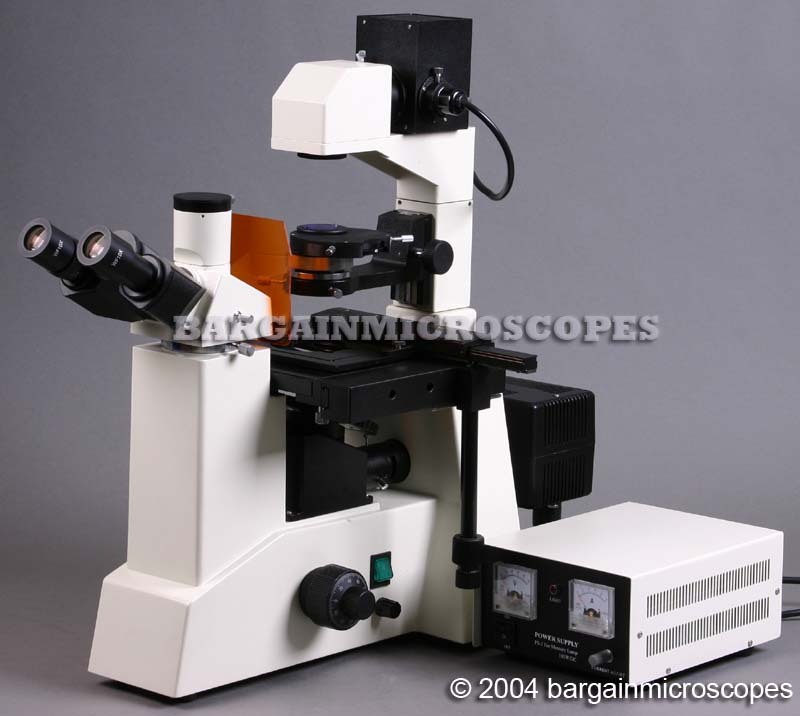 If You Need an Inverted Fluorescence Microscope, and Don’t have a Fortune to Spend on a Brand Name, then This is for You. 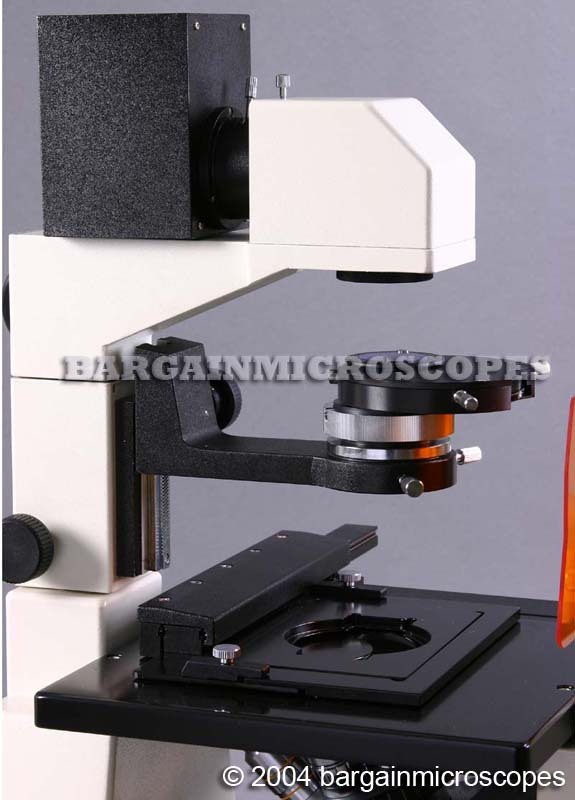 For Most Applications, This Microscope will be Plenty Sufficient. Uses Incident Light Excitation to provide a Clear and High Contrast Epi-Fluorescence Image. 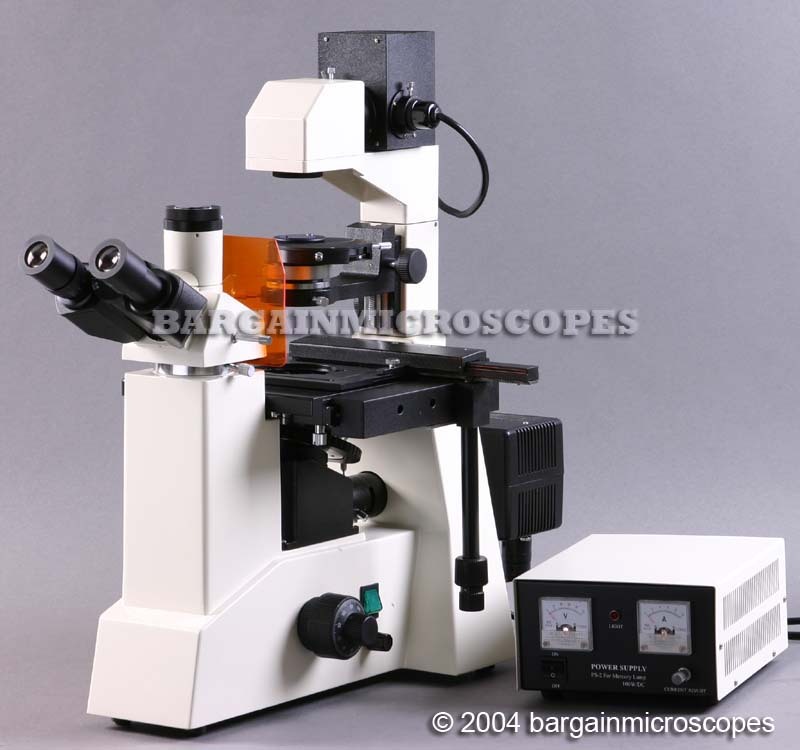 Includes Phase Contrast Kit for Observing Translucent Low Contrast Specimens! Compare to Similar Units costing $20,000 with Name Brands! 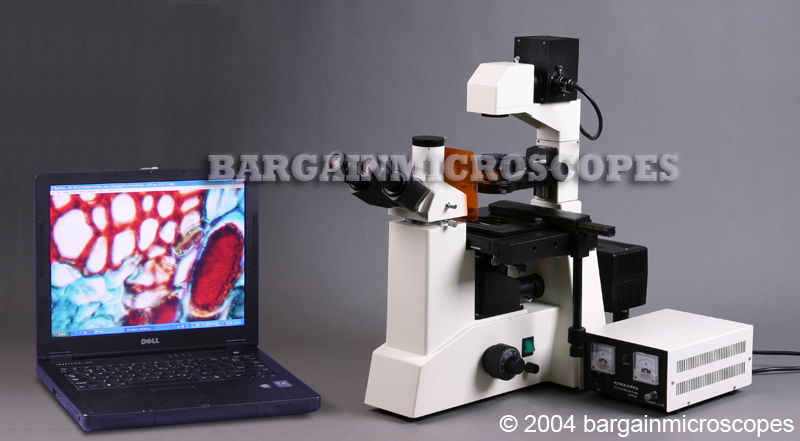 Fluorescence microscope for viewing biological slides stained with fluorescence dye. Three Fluorescence (and Brightfield Transmitted Light) Magnifications: 100x, 250x, and 400x. Three Brightfield Long Working Distance PLAN DIN Objectives: 10x (0.25 NA, 8.1mm Working Distance), 25x (0.40 NA, 4.8mm W.D. ), 40x (0.60 NA, 3.3mm W.D.). Three Phase Contrast (Non-Fluorescence) Magnifications: 100x, 250x, and 400x. Three Phase Contrast Long Working Distance PLAN DIN Objectives: 10x (0.25 NA, 8.1mm W.D. ), 25x (0.4 NA, 4.8mm W.D. ), and 40x (0.60 NA, 3.3mm W.D.). Objectives Designed for Cover Glass Thickness 1.2mm (bottom of glass dish). Fluorescence Light Source: Super High Pressure Mercury Lamp (100W DC). Mounted to the Rear and Enclosed in a Sturdy Metal Housing. External Power Supply for Mercury Lamp: 100W DC with Current Adjustment Knob and Volt / Amp Analog Gauges. The Arc of the Mercury Lamp is Easily Centered by using Two Lamp Positioning Knobs on the Lamp Housing. Epi-Fluorescence Illumination System: Blue, Green, Violet, and UV Excitation Fluorescence Filter Cubes. BLUE Fluorescence Excitation Dichroic Filter Cube: Excitation Spectrum 420 – 485nm, Emission Filter 515nm. GREEN Fluorescence Excitation Dichroic Filter Cube: Excitation Spectrum 460 – 550nm, Emission Filter 590nm. VIOLET (V) (Purple) Fluorescence Excitation Dichroic Filter Cube: Excitation Spectrum 395 – 415nm; Emission Filter 455 nm. ULTRA-VIOLET (UV) Fluorescence Excitation Dichroic Filter Cube: Excitation Spectrum 330 – 400nm; Emission Filter 425 nm. Other Fluorescence Filter Spectrums can be Special Ordered. Contact us for Details and Costs. BrightField: Above Stage Transmitted Light Source: Variable Intensity 6V/30W Halogen Illumination. BrightField: Focusable Field Diaphragm Under Top Frame to allow for Better Control and more Efficient Use of Light Source. 30 Degree Inclined Trinocular Head. Above-Stage Long Working Distance (50mm) Condenser, with Iris Diaphragm and Swing-Out Filter Holder. Phase Annulus Rings for 10x, 25x, and 40x Built Into Phase Condenser Turret. Also has Setting for Brightfield. Condenser (Above Stage) Centering Knobs for Precise Positioning of Condenser Over Objective. Three Brightfield Filters Included: Blue, Green, and Frosted White. Rack and Pinion Steel Gears with Knob to Easily Move Condenser Up and Down Relative to Stage. Fluorescence Light Iris Diaphragm with Condenser Centering Adjustment Knobs. Frosted White Filter Selection Bar. Ability to Insert Frosted White Filter in the Light Path from the Mercury Lamp Source. Large Mechanical X-Y Movable Stage: Size 255 x 225mm. Low Position Coaxial X-Y Specimen Holder Movement Knobs – Range of Movement: 115mm (X-Direction) x 82mm (Y-Direction). 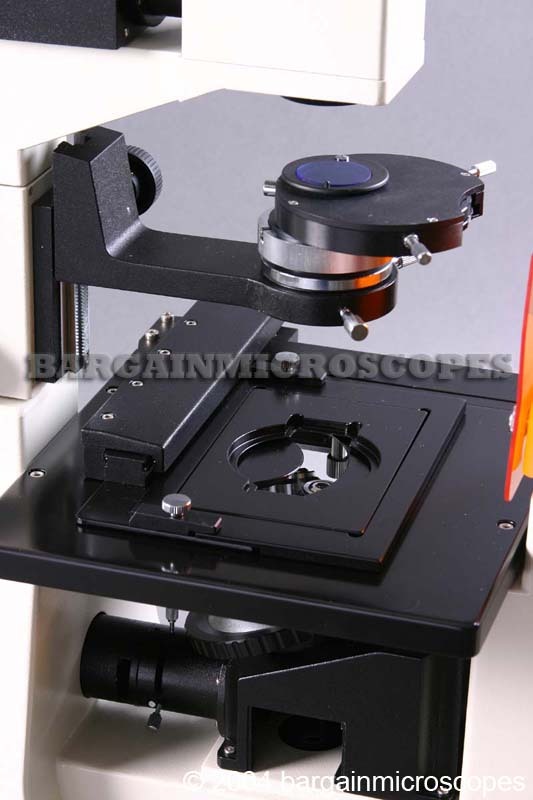 Capability for Easy Removable of Specimen Holder Plate and Holder Mechanism. Includes Three Types of Specimen Holder Plates for Various Applications. 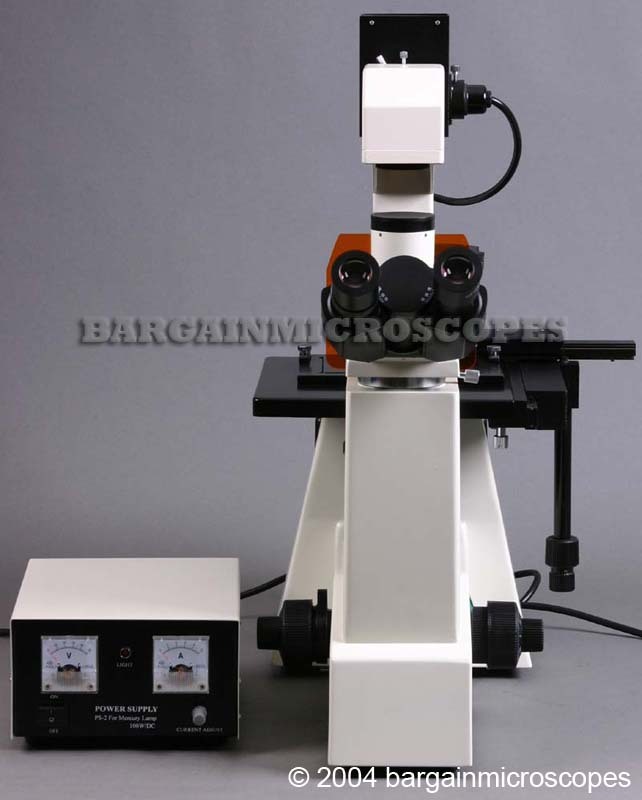 Total Overall Height of Microscope: 580mm. Orange stray light protection eye guard on front of microscope. Includes: Two Extra Mercury Bulbs (3 total included, for fluorescence observation). Includes: Instruction Manual, Dust Cover, Two Extra 6V/30W Bulbs (for brightfield), and Extra Fuse. Includes spare blank dichroic filter cube. This is useful if a customized wavelength filter cube set is needed. 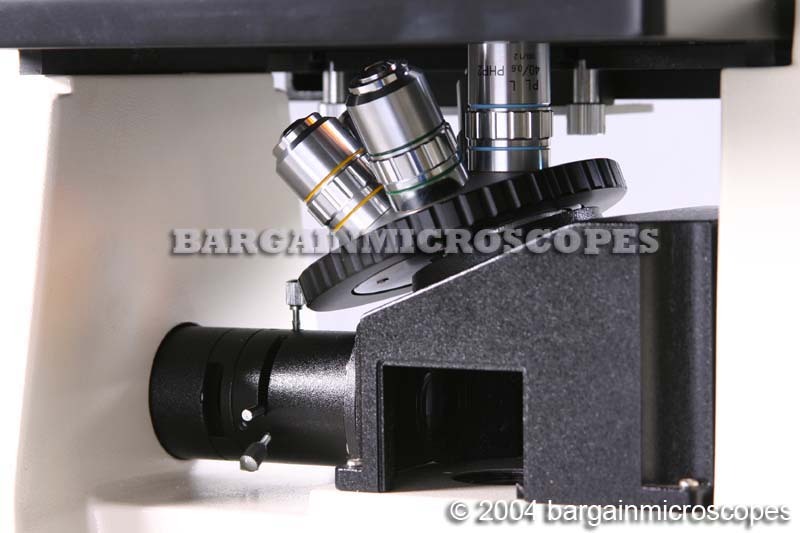 Warranty is 3 months on all microscope equipment.